The next chapter in the history of the Byzantine Empire features two emperors, Heraclius and Constans. Their ability to survive an onslaught of wars that would have brought down many an empire would solidify the Byzantine model for centuries to come. As mentioned in the previous article, Heraclius became successor to Phocas when he led a rebellion against him in 610. Heraclius reigned until his death in 641, and his military accomplishments were amazing as you will soon see. 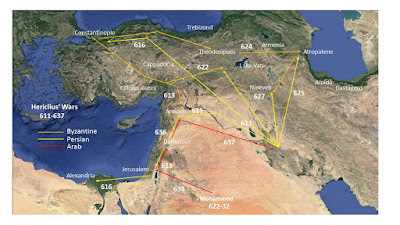 The map shown above summarizes the military activity of the Byzantine Army during the reign of Heraclius. Click on the image to enlarge it. 622 – The Byzantines defeat the Persians in eastern Anatolia. The gap in the Byzantine–Persian War starting in 616, is explained by two factors. First, the Byzantines had to re-group after their initial losses, rebuild their army, and borrow money. Second, they were engaged in the Balkans fighting the Slavs, Goths, Bulgars, and Avars; enemies that had to be dealt with before the army could again be directed to the east again. At one point in 616, Constantinople, itself, was under siege by the tribes of the Balkans from the west and the Persians from the east. Heraclius turned out to be the consummate war leader, who was able to withstand all the attacks on his empire, but died an ill man, broken by the pressure of war. His people did not appreciate all he was able to accomplish and did not miss him when he was gone. Heraclius window, Martina, had a son with him, who she favored over Constantine the son of his first wife, Eudocia. Constantine was named emperor, but was sick with Tuberculosis, and died after three months as emperor. Martina supported her son Heraclonas as the replacement, but he was eventually pushed aside by the handlers of the eleven year old Constans, the son of Constantine. The boy matured quickly and by 645, ordered his navy to attack the Arabs (Islamists) at Alexandria. The attack force eventually had to abandon the effort when resistance stiffened. During the years 645-648, Constans was on the defensive as the Arabs attacked Byzantine Africa and Cyprus, but then his luck turned. The aforementioned losses were reversed and then in 654, as the Arabs were starting a major attack, an Arab civil war broke out. Constans used the internal conflict between the Arabs as an opportunity to reorganize the Byzantine army, and he accomplished the task brilliantly. Creating a novel organizational structure called “themata” (themes), he divided the empire into geographical territories. Each theme was made up of a mobile army unit settled in a specific district that it was assigned to defend. Its soldiers were given land grants to tie them to the land and fund the purchase of supplies. This structure created loyalty because every man was now motivated to protect his own property. Each theme utilized a Greek name, such as Anatolian, Thracian, and Armeniac. In 661, the Arab Civil War ended and from the Byzantine point of view, the wrong side won. The losing side had been easier to create treaties with than the winner, so Constans looked forward to a more hostile enemy. But he also had pressing problems in the west, so he put off going into battle with the Arabs, and sailed for Thessalonica in 662. After setting up a new theme on the Greek Peninsula, the emperor departed for Tarentum in the heel of Italy the next year. He fought the Lombards and was victorious over them before moving on to meet with the pope in Rome. Later that year, Constans moved on to Sicily which was strategic to his efforts to strengthen his control over Italy and Northern Africa. In 665, there was an Arab attack on Africa which had to be fought off. Meanwhile the Arabs continued to peck away at imperial holdings in Anatolia. In 668, one of the Byzantine military leaders, Saborius, taking advantage of the emperor’s five year absence, declared himself emperor and put together an army force to attack Constantinople. On the way there, he fell off his horse and was killed. This good fortune enjoyed by Constans was short-lived, however, because the emperor was assassinated that summer while in the bath. Dead at 38, he had accomplished much – keeping the Arabs at bay and strengthening imperial holdings in Sicily and Africa. Can you please cite your sources?!? My principle source is A History of the Byzantine State and Society by Warren Treadgold. A fascinating empire, the bulwark of Christianity in the East for over a millennium. I read Steven Runciman's history of the Crusades a few years ago, and I was impressed when he narrated how the Crusaders, when they passed by Constantinople, could not believe that a city of such beauty and elegance could exist in the world.